1985. 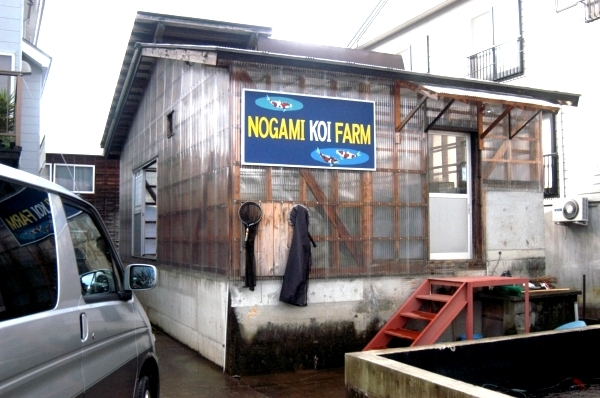 Nogami Koi farm – Muikaichimachi, near Nagaoka. I found this outlet alone and unaided but only because it was directly opposite Ogawa San’s house and a few metres across the road. There was a Japanese garden pond to my left and the lovely house in front. To my right there were two shallow concrete ponds coloured and murky after potassium treatment. Some outlines could be seen but not clearly. I tried the door to an indoor house up some steps but found it to be locked. There was a pathway down the right of the house and indoor Koi houses could be seen. I made my way down there only to be frightened out of my shoes as a mid-sized brown dog lunged at me and then let out a series of warning barks. Thankfully he was held by a thick chain. I decided to return to the house to find out if anyone was at home. Just then Megumi walked over and told me the name of the outlet and that the owner’s name was Hisato Nogami. He then checked the house door but no-one answered. My first impressions – ‘a place to check out in the future’.